The day's activities should be created around your individual desires. A personal consultation on arrival ensures that we understand exactly what you want to do. 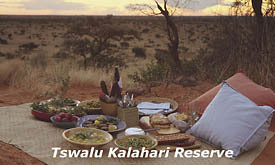 The game drives are never standard; if, at a moment's notice, you want to spend an entire day in the bush, we will pack a delicious picnic and take off. 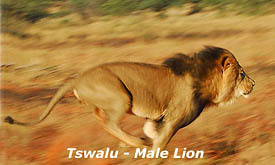 Bush walks offer the chance to get closer to the land, even to track desert black rhino on foot. 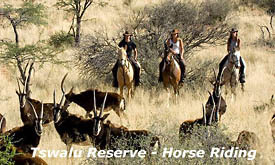 Top quality horses can accommodate all levels of riding ability. 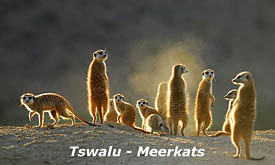 You can explore the Kalahari from every possible angle. Our two donkeys, Pedro and Don Juan, pull a traditional Kalahari cart, still a main form of transport for many here today. Hot-air balloon trips over this vast wilderness can be booked in advance. 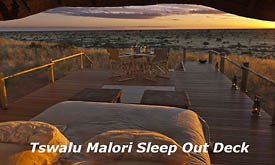 Or you can simply sleep out under the thousands of stars in the Kalahari's "diamond skies". For anyone with a particular passion, special talks can be arranged with the reserve's ecologists. 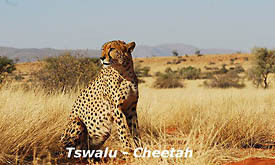 Photographers will find unending possibilities here at Tswalu, combining shots of unique wildlife with dazzling panoramas. Walks to ancient archaeological sites will reveal rock carvings created by the Bushmen up to 380,000 years ago, some of the oldest art on Earth. At other times, the pools or shaded salas beckon. Our exclusive spa completes your relaxation; its range of soothing and revitalising treatments celebrates the natural heritage of Africa. Tswalu Kalahari Spa is now a combination of sensual spaces which combine to create an inspirational venue for what must be one of the most unusual spa experiences in Africa. 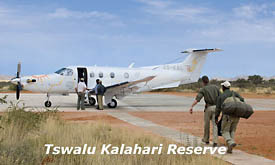 Designed to enhance the natural beauty of the Kalahari and take advantage of the superb climate, the outdoor treatment area is within an indigenous spa garden where guests may find the occasional antelope grazing alongside them and be lulled into a deep state of relaxation by the sound of birdsong. Surrounded by endless blue skies and the unique vegetation of the Green Kalahari, guests who indulge in the authentic signature massages performed by local therapists, will discover the Spa's ethos of "closer to the land, closer to the people." The indoor spa area is a natural extension of the earth, inspired by nature and the splendour of the Kalahari, with natural finishes and fabrics and simple spaces which together create a sense of tranquility and barefoot elegance. 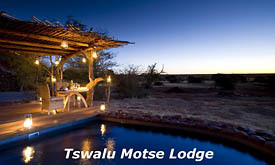 Guests may also choose to have their treatments at an outdoor tsala, where a rustic structure protects one from the elements and is positioned to give a bird's eye view of the open grasslands of the reserve against the backdrop of the Korannaberg Mountain range. In terms of social responsibility guests are encouraged to enjoy a tour of our new staff village (built on environmental principles); the healthcare clinic; our registered pre-school; and the adult literacy centre.